From Blaenavon or Brynmawr take the B4248, then by the cattle grid, turn into the parking area at the old mine access road. Park in the parking area at the gate. Please do not block the footpath or cycle path. Access to take-off is by foot only (a hard carry up). Lots of space to rig on top of the hill, with an easy gentle rounded take-off. Take-off E for ENE to East, or take-off A when the wind has more North in it. Top landing area between (A) & (E) is vast, but the ground is rough and the front section slopes gently to the edge of the hill. Top landings should be carried out well away from pilots taking off. There is a fence that runs along the hill about 50mtrs behind take off. Slope landing by paragliders presents no real problems. The land between the hill and the road (B) is rough and broken and not recommended for hang glider bottom landing, however landings by paragliders are possible with care. Hang gliders should land on the other side of the road. The obvious flat section of land (C) drops away sharply into a bog, on the side furthest away from the hill. Hang gliders need to make an accurate approach in order to avoid the likely consequences of an overshoot, bent metal. The bog already contains the remains of one aircraft, a Halifax Bomber (22nd May 1944). This area is easiest when the wind is off to the North. If in doubt land on the rough open common (D) to the North of the flat area, just before the embankment. A fairly friendly site, particularly late in the day, though capacity is limited if the wind is off. A pleasant ridge run of around 5km (3 miles) to Varteg is possible in the right conditions. No real hazards. But the site is frequently used by schools and low airtime pilots, and can therefore become quite crowded. Dogs are not permitted on the hillside. Please leave the gate as you find it. There will be a period of closure for 2 weeks between 15th March and 15th May for Lambing; this will be determined by the Graziers during that period. If there are sheep with lambs settling on the mountain between these periods and the Closed for Flying sign is not on the gate, please advise the club and the closure period will commence. The club will notify members via our communication systems. If there are lambs on the hill then do not fly. 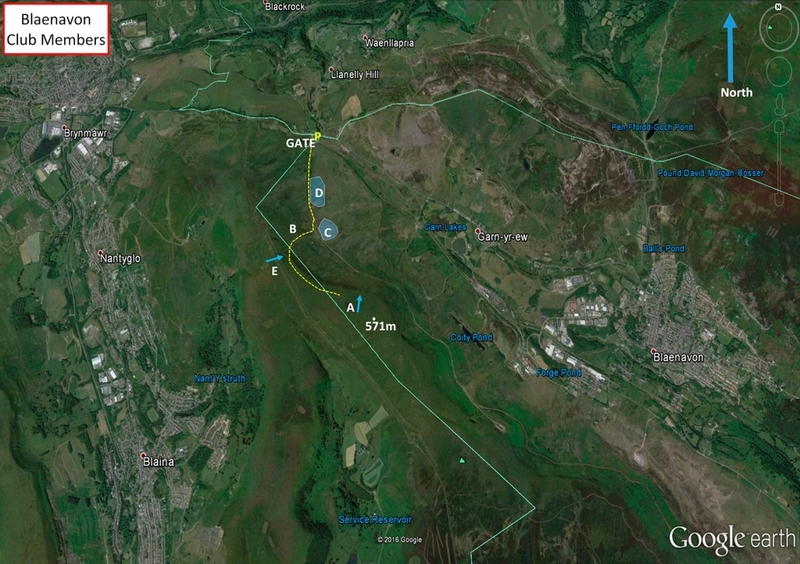 Some lovely and exciting XC flights can be achieved from Blaenavon. You’ll get to see some fantastic scenery over the valleys which were the industrial and coal minings centres of South Wales. Many of the industrial buildings remain. 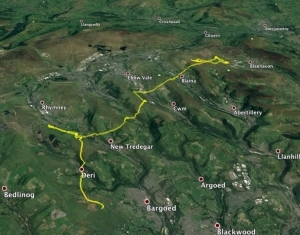 The obvious route is in a north easterly wind to get enough height on the Blaenavon ridge from a thermal (often coming off the Big Pit mining museum area or Blaenavon town), before gliding back towards the Blaina ridge, then Ebbw Vale, Abertysswg ridge, Pontlottyn and so on. Becareful that you have enough height before going over the back of the ridges, especially when it’s windy as turbulence and rotor could be coming off the backs of all the ridges. Also beware of thermalling over and behind the wind turbines – expect there to be lots of turbulence behind them. Many of the turbines are inconveniently located right at that point thermals trigger off. Landing spots in the valley vary and it is often easier to land up on the tops of the ridges and walk down. The valleys train lines run mostly north to south so are not that useful if you need to head east or west. It’s often easier to get a taxi than trying to hitch through the valley road system. or alternatively try to head north to the Heads of the Valleys road and hitch back east along this dual carriageway. A memorable XC from Blaenavon by Alex Kennedy – stopping off at Pontlottyn to chat to other pilots before carrying on. A memorable XC flight by Alex Kennedy in 2018 – stopping off in Pontlottyn to chat to others before carrying on. Coity Mountain 3.8km WNW of Blaenavon Village near Big Pit Museum just off the B4248. 3.2km SE of Brynmawr.